Kevin Hart and his power. Wolf in a cinemascore in an 84% on Rotten Tomatoes audience rating in climbing this movie will have some very good Flags. Funny this movie is making the money people thought green book would. Why did everything plummet this weekend? Was last week inflated? I don't think so. After all, 30% increases on Saturday are perfectly normal for family films, aren't they? Green Book is far from over though. Could still gross more than The Upside in the end. I guess Upside hurt Poppins? 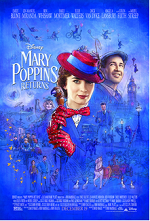 Poppins has been able to find an audience during the holidays, but now they're over and its run will end quickly. Last weekend's weak hold was already a proof that the "sub-100M outside Xmas" idea was correct. Really solid numbers for The Upside. Looks like KH still has some solo drawing power left in him after all and with that Cinemascore it should have good legs. I guess it shouldn't be that surprising that the holdovers aren't holding that great considering the holidays are now over with, but man those drops for Bumblebee and Poppins are still pretty ugly.